Place the veg stock, garlic and ginger in a blender and whizz until smooth. If your blender isn't big enough, do this in two batches and make sure to keep the lid on tight! Pour the blended stock into a medium-sized pot and bring to the boil. Once it's boiling, add the noodles and cook as per the packet instructions. Chop the button mushrooms or roughly tear the oyster mushrooms. Add the oil to a frying pan set on a high heat, then add the mushrooms along with the soy sauce and cook for 3 minutes, stirring regularly. Once the noodles are cooked, remove them from from the stock with a slotted spoon and divide them between four large bowls, then pour over the broth. Now layer up the bowls by placing some of the red pepper strips, grated carrot, red cabbage and spring onions in each bowl, along with some beansprouts. Each bowl should be very colourful and rainbow-like in terms of colour. 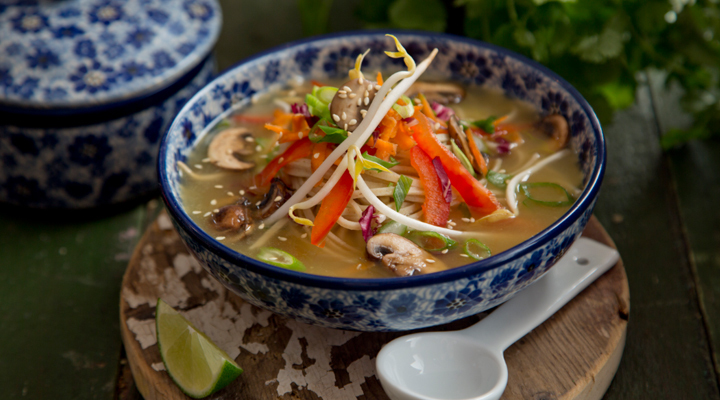 Top with the fried mushrooms, then top each bowl with a sprinkle of sesame seeds and serve with a lime wedge.